As a much younger regional manager for a company that manufactures and sells the leading brand of gasoline pumps, I can relate a valuable lesson that can be learned about pumps. 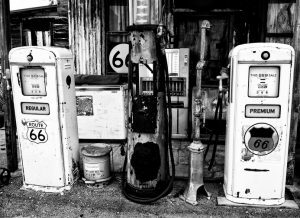 At that time, all gasoline pumps were metered with mechanical meters and registers. No electronics were used. There was no self-service. I can be reasonably assured that some, or most, of you will remember those days. Not all stations on every corner were self-service. You needed gas, you pulled in and an attendant would greet you, clean your windshield, check your oil and coolant, check your tires and belts and deliver your gasoline whether you wanted a dollar’s worth or a fill up. The stations at that time typically had two bays used for servicing, oil changes, selling and repairing tires, tune-ups and any other services the owner or operator could profit with. There were usually one to two islands with two to four gas pumps to deliver product. Some stations began to sell bread and milk and the C-store was born. Then came a revolution in gasoline pumps (dispensers) as the pumps are all now submerged in the fuel storage tanks. Originally many of the dispensers on the gas islands were suction pumps and many times, on a hot summer day, they would vapor lock. You may remember the operators hosing down the drives, not so much to clean but to cool the surface to prevent vapor lock from shutting down the pumps. With the sheer number of dealers to control at that time, the oil companies had very large management teams and repair crews who were needed to keep the product flowing. They had large fleets of tankers working from the jobbers or the company-owned racks. They began to take notice of the dealers who had the greatest volume from their corner and provided incentives for their continued growth. Automation would reduce the number of personnel needed to make a profit. They saw that with the volume locations or “pumpers” as they became known, had problems with keeping up with the required report details for management. The company that I worked for had a forward-thinking group of engineers. They developed the first “electronic dispensers.” Everyone wanted the benefits that these new systems offered, but no one wanted to buy the first one. I remember doing demonstrations for a major oil company proving that they could remotely monitor their stations, the volumes pumped by grade and when to schedule their next delivery with a full tanker and not just drop a partial load. The first station we monitored was in Pennsylvania and the district office was in New Jersey. Many managers were called in to witness this amazing feat. Computers then were only using DOS so the system just filled in spread sheets automatically. They immediately saw the proof of what they could save in just managing deliveries and offering self-service. That was the beginning of what everyone sees every day today – modern service stations using electronics to control costs and add profits. When it was known that the innovative system worked as advertised, an oil company picked one of their pumpers on a major intersection to put it to the test. They immediately proved their worth. Being first they were then recognized as industry leaders. The rest is history. You cannot buy gasoline today without the use of a modern, innovative, trouble-free electronically-monitored gas pump with operator remote setting and control. Wastewater pumps today are like the old, mechanical gas pumps of the past – still using the old submersibles in wet wells as has been done since the 1950s. For some reason, the management has not yet caught on. Innovation is available. How long will management tolerate losing money to wasteful maintenance and excessive manpower use? The DIP System® is here now. Who wants to be a leader?